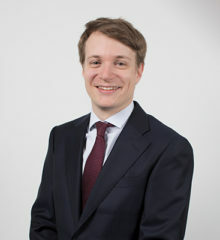 Sam Moss is an international arbitration lawyer trained in both civil and common law, and focuses on disputes in the construction and energy sectors. He has acted as counsel or arbitrator in numerous international arbitration proceedings conducted under the ICC Rules, the Swiss Rules, the DIAC Rules, and the ICSID Convention, and governed by a variety of substantive laws, including Swiss, Ukrainian, Qatari, US, Lithuanian, and Public International Law. He also assists clients with the management of claims in construction projects, and on the drafting and negotiation of construction contracts. Sam Moss regularly publishes and speaks at conferences on construction disputes and arbitration, and is active in several professional organisations. He is the founder and co-chair of YConstruction, an international group for young construction arbitration practitioners, and serves as an officer of the International Bar Association’s International Construction Projects Committee. He is also a member of the Swiss Arbitration Association (ASA), ASA below 40, and the Young Canadian Arbitration Practitioners. Sam Moss has been ranked for several years as a leading construction lawyer, and as a Future Leader in International Arbitration, by Who’s Who Legal. Prior to joining LALIVE, Sam Moss was Assistant Legal Counsel at the Permanent Court of Arbitration in The Hague (2006-2007), and served as a law clerk to a judge of the Quebec Court of Appeal (2005-2006). He is pursuing an MSc in Construction Law and Dispute Resolution at King’s College, London, and holds a Master of International Studies in International Law from the Graduate Institute of International and Development Studies in Geneva (2007-2009), and joint common and civil law degrees (B.C.L./LL.B. (Honours), with great distinction) from McGill University (2006), where he served as Executive Editor of the McGill Law Journal (2005-2006). Samuel Moss is regarded by clients as a "very impressive young lawyer who will go far". Samuel Moss receives widespread praise from peers and clients. He is described as "a rising star" with a "fine grasp of the complex technical issues". See the original version in Turkish. The Role of Counsel in Document Production: How Far Should the Duties Go? What Are the Sanctions? Tokyo 21/10/2014 Sam Moss Speaker: The Swiss approach to contract interpretation – Better suited to the realities of international construction contracts?